LONDON (AP) — Household incomes in the U.K. picked up during the summer, official figures showed Tuesday, a development that, if sustained, should shore up the British economy in the run-up to Brexit. The Office for National Statistics said Tuesday that average earnings excluding bonuses were up 2.9 percent over the three months through July from the same period the year before. In the three months to June, they were up 2.7 percent. Analysts said the rise can be largely attributed to the 3 percent pay increase awarded to more than a million National Health Service workers in England, including cleaners, nurses, paramedics and midwives. The increase started being rolled out from July. Samuel Tombs, chief U.K. economist at Pantheon Macroeconomics, noted that helped push up public sector wages’ annual growth to 3.1 percent in July, from 2.4 percent in June. “The shift-up in public sector wage growth should endure,” Tombs said. The increase in pay will help households that have seen their living standards squeezed for almost two years, as wages are now outstripping inflation, which in the year to July stood at 2.5 percent. That’s a potential boon to the economy at a time when there’s much uncertainty surrounding Britain’s exit from the EU in March. The Bank of England last month raised its main interest rate by a quarter point to 0.75 percent to get inflation back towards target. Inflation has fallen back in recent months as an increase in import price caused by the pound’s fall in the wake of the June 2016 Brexit have faded. But rate-setters think higher wages will limit inflation’s decline. Wage growth had so far been stubbornly low even though the labor market is strong — Tuesday’s figures showed that unemployment remained at a 43-year low of 4 percent in the three months to July. Improvements may be slowing, however, with only 3,000 people added to the number in work, and although unemployment fell 55,000, that was largely due to an increase in the number of people termed inactive. Overall, the figures are not expected to alter expectations that the Bank of England will keep interest rates on hold on Thursday and over the next few months as the Brexit negotiations reach their crucial stage. There’s no clear picture of what Britain’s future relations with the EU will be. 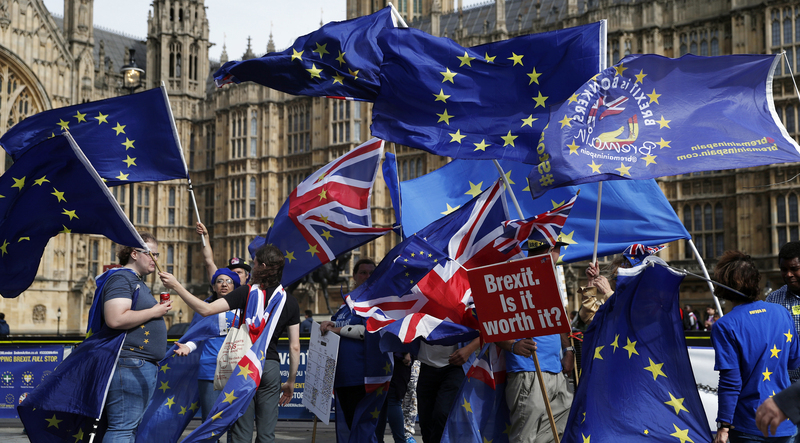 “Uncertainty over Brexit provides ample reason for the bank to sit on its hands for now, so this week’s policy meeting should prove a non-event,” said Ben Brettell, senior economist at stockbroker Hargreaves Lansdown.